Excerpt below adapted from Circles of Compassion: Essays Connecting Issues of Justice (2014). Of the world’s more than seven billion people, more than 840 million are counted as suffering from chronic hunger. While shockingly high, this is a conservative estimate based on strict criteria that assumes a “sedentary” lifestyle with prolonged caloric deficiency lasting more than a year. The number of people officially counted as hungry can more than double when “normal” and “intense” levels of activity are intermixed with the calculations. The numbers of undernourished, food-insecure people increases further still when intermittent food shortages and nutritional intake are considered. Children suffer the most severe consequences of our broken food system, with more than 6,000 dying every day of malnutrition and hunger-related causes. With more than 250 children dying every hour, why is it so rare that global hunger makes the nightly news? In part, it’s because such extreme and widespread hunger and death are the norm. With respect to the billions of people and animals suffering as a direct result of our food production system, it is human action, intention, and lack of necessity that solidify these tragedies as injustice. Suffering in itself is not injustice. Similarly, harm is not necessarily violence. Accidents happen. Natural disasters and diseases happen. It is the choice to participate in systems that inflict unnecessary harm that constitutes violence and injustice. Gandhi brought widespread attention to conceptualizing hunger and poverty as forms of violence. While less obvious than physical acts of violence, hunger is not merely the result of bad fortune and inadequate assistance. Hunger is also the consequence of an unjust, often corrupt, food system that allows profits to trump need, and rewards the powerful for exploiting the vulnerable. To better understand hunger as violence, consider that the pain imposed by hunger is constant and unrelenting—physically, mentally, and emotionally. Imagine the incessant, gnawing ache of never having enough food. Imagine the need to ration those small amounts of food that do become available, then having to decide who in your family receives a particular share. Perhaps most heartbreaking—and something few of us could even begin to imagine—is the despair of watching helplessly as our children wither away because we can’t feed them enough food or the right kinds of food. 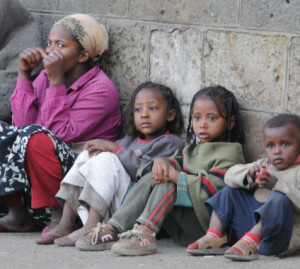 Photo: Grant for Ethiopian feeding program in 2012 via partnership with International Fund for Africa. Hunger is also a form of structural violence that tears through societies, destroying lives and debilitating countries. Undernourished adults and children suffer poor health, low energy levels, and a reduced ability to concentrate. This makes it all the more difficult to work the arduous hours that are often required for mere survival. For children fortunate enough to attend school, their learning is severely impaired. 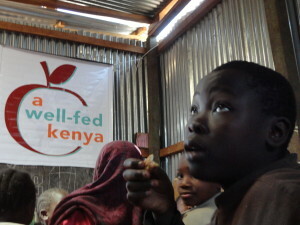 Photo: Grant for school feeding program in 2013 via partnership with A Well-Fed Kenya.